How Does Acupuncture Help With Ageing Skin? • Hypodermis – the deepest area containing fat and blood vessels Underneath these layers are the muscles of the face. Ok… So why do we get wrinkles? The sun produces UVA/UVB radiation. When the UVA/UVB’s come in contact with the skin, they damage our collagen and elastin within the dermis and impair the skin’s ability to repair itself (Canadian Dermatology Association, 2018). When our skin can’t keep up with sun damage repairs, wrinkles form. Regular sunscreen use is our greatest ally to minimize the impact of photoaging. 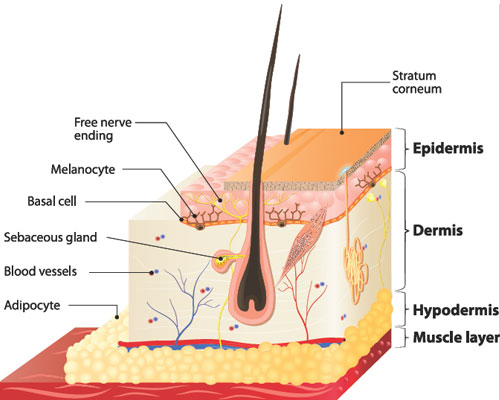 The fat layer located in the hypodermis of our skin also goes through an extensive remodelling as we age (Figure 1). In areas where fat decreases, folds become more visible and in areas where fat increases, sagging becomes more apparent (Donofrio, 2000). These changes to the skin become more apparent over time- but fat remodelling isn’t the whole picture. Our skin’s appearance is also influenced by mimetic muscles. These are the muscles of facial expression, located below the hypodermis of the skin. They let us smile and frown… and over time contribute to the expression of wrinkles. When we are young, our muscles are the most fluid and flexible. As we age, they become stiff and less mobile, resulting in the skin bunching and folding on the surface of the tight muscles (Le Louarn, 2007); helping form the wrinkles we know and love. What does all of this have to do with cosmetic acupuncture? Acupuncture improves the circulation of Qi and Blood (Click here to check out: “What is Acupuncture?”) throughout the body. When stiff muscles meet acupuncture needles, they have a tendency to relax and lengthen; resulting in a smoothing out of the skin and decreased wrinkle visibility. The more relaxed the muscles, the less the skin bunches and folds on the surface. Research into how cosmetic acupuncture works is still developing. Current research is exploring mimetic muscle tone and increased oil production and retention in the skin over time with treatment (Donoyama et al, 2012). Don’t panic! Cosmetic acupuncture’s effect on oil production won’t cause your skin to break out. Think of the increased oil production working as moisturizer from the inside out, rather than clogging our pores. 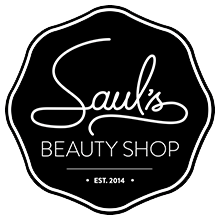 Oil helps to plump and firm our thinning skin and offset the changes in fat distribution of the face as we age. Doesn’t cosmetic acupuncture help my skin make more collagen? Collagen has become the buzz word surrounding skin health these days, and although I’d love to say the explanation is that simple…. the research isn’t there. Wrinkles develop over time as part of our natural aging process from the effects of sunlight, thinning of the skin, decreased collagen production, shifting fat distribution and increased mimetic muscle tone. The mimetic muscles of the face are targeted during cosmetic acupuncture treatment, resulting in their relaxation and subsequent smoothing of wrinkles. 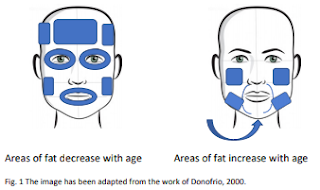 Oil production also increases in the skin during cosmetic acupuncture treatment working to offset the changes in facial fat distribution as we age. And Mei Zen cosmetic acupuncture? • The 10 treatment protocol brings Qi and Blood to the face to generate lasting results. Over time and regular use the mimetic muscles will tighten once again and wrinkles will become more prominent. • Once-a-month follow-ups, after the initial 10 treatments, are enough to keep the muscles nice and relaxed and sustain skin oil production for the next 1 – 3 years. Where’d the info come from?